The mPort features built-in Wi-Fi and Ethernet to attach the sensors to the IP network. Once connected, the mFi controller software enables complete control over all connected sensors. 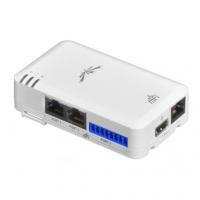 mFi™ is a Machine-to-Machine management system from Ubiquiti Networks, Inc. The mFi hardware can be managed and monitored from the mFi Controller software. The mFi Controller software allows you to create rules that trigger actions based on data from your mFi sensors. For example, motion detection could turn a light on, or a high temperature reading could trigger a fan. The mFi platform is compatible with third-party devices, making the options unlimited! Powerful Functionality Create powerful relationships between sensors, machines, and powered devices. Cloud and Mobile Support Access multiple mFi networks from any remote location through a web browser. New devices can instantly be discovered and provisioned through the cloud. Sophisticated User Experience From auto-detection of machines through intuitive and powerful rule creation, the mFi Controller transforms a machine network into an automated symphony.